Did you see the unveiling of the new $100 Bill? Although, it has a snazzy new high-tech design to ward off counterfeiting, I am a little conflicted about its changes. Mr. Benjamin Franklin still highly adorns the $100, but they have taken away the Liberty Bell and replaced it with an inkwell. Oh my! Inkwells are many, but there is only one Liberty Bell of Independence Hall. Ringing on July 8, 1776, to summon its citizens to hear the first public reading of the Declaration of Independence. Then in 1837, it was revered as a symbol to the abolition of slavery in the United States of America. There is quite a significant importance in our Libery Bell that adorns the C-note. Oh wait, the liberty bill is now inside the inkwell. *sigh* Just not as cool looking. The $100 bill also was tagged with a bright blue security ribbon composed of thousands of tiny lenses that magnify objects in mysterious ways. Government says, “move the bill and the objects move in a different direction”. Hmmm… You mean you can’t pull the stip out like in the current bills? Oh hey, Mr. Benjamin Franklin’s face and the and the lower left, front “100” of the bill will change color from copper to green when you move the bill around. Well, the new $100 bill looks quite interesting. I look forward to playing with my C-notes like a druggie spectacles bright lights. You see, according to CBSNews.com, that new blue security ribbon gives a 3-D effect “to the micro-images that the thousands of lenses will be magnifying. Tilt the note back and forth and you will see tiny bells on the ribbon change to 100s as they move. But that’s not all. Tilt the note back and forth and the images will move side to side. Tilt the note side to side and the images will move up and down.” What do you think? Is this New High-Tech $100 bill strong enough to keep counterfeiters away or make them eager for a bigger challenge? The new high-tech $100 bill will go into circulation Feb. 10, 2011. Mrs. Nespy’s Frugal World put together a great interview featuring moi. She got a knack for putting together great interviews! She already hosted great interviews featuring Adam, Ninja, and Brad. Check em’ out! Mrs. Nespy has quite a cool blog! This week I found out I am one of three recipients to win an Apple iPad, in the Money Crasher’s File Taxes Online in 2010 – Win an Apple iPod Giveaway. I think the tech Gods are speaking to me. Don’t knock it until you try it! A Southwestern Tofu Scramble taste very similar to scrambled eggs. Now if you want the yellow color of scrambled eggs, just add a little ground tumeric. Wha la! 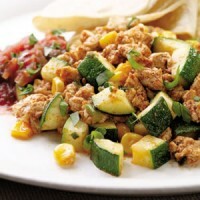 Serve the scramble with some homemade salsa, veggie links, and corn tortillas. YUM! YUM! Oh ya, don’t forget the coffee! Directions: (Step 1) Heat 1 1/2 teaspoons oil in a large nonstick skillet over medium heat. Add tofu, chili powder, cumin and 1/4 teaspoon salt and cook, stirring, until the tofu begins to brown, 4 to 6 minutes. Transfer to a bowl. (Step 2) Add the remaining 1 1/2 teaspoons oil to the pan. Add zucchini, corn, scallions and the remaining 1/4 teaspoon salt. Cook, stirring, until the vegetables are just tender, about 3 minutes. Return the tofu to the pan and cook, stirring, until heated through, about 2 minutes more. Remove from the heat and stir in cheese until just melted. Top each serving with 2 tablespoons salsa and 1 tablespoon cilantro. Simple Life in France: No Shopping Compact: limits, unintended effects? Evolution of Wealth is giving away a copy of Enjoy Your Money! Little House in the Valley wrote her first eBook called A Simple Guide to Improving Your Credit Score and would love your feedback! Have you checked out Mint.com for their new Ask a Question? It’s a place where your personal finance problems are solved. Another great feature for the Mint community! This entry was posted in Finances and tagged Brunch, new $100 bill on 2010-04-25 by Christine.